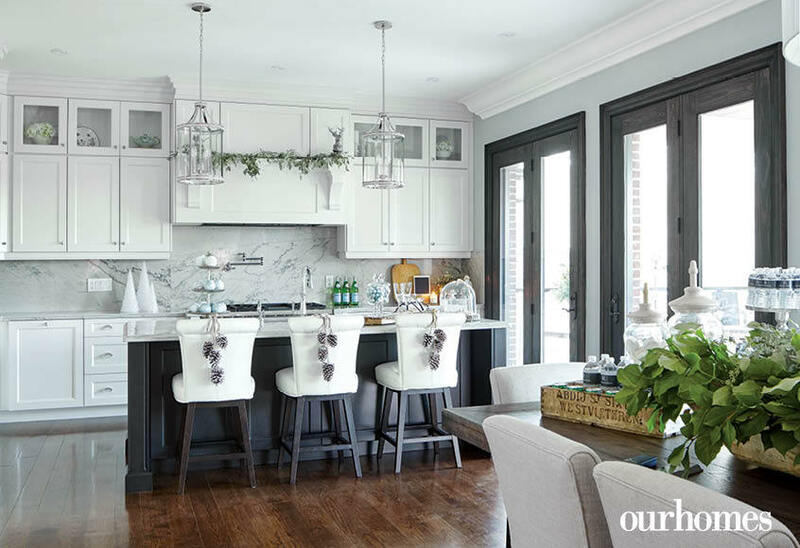 A family home with a black-and-white holiday vibe brings comfort and joy. 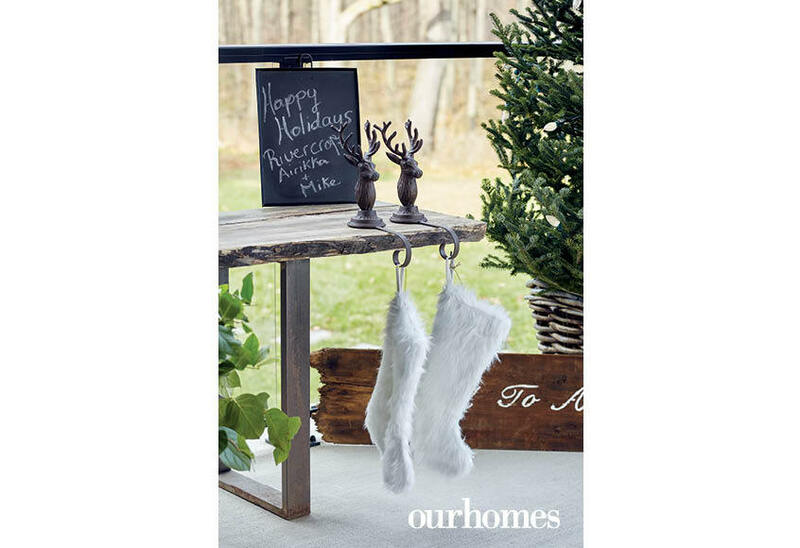 A version of this article originally appeared in the Holiday/Winter 2018/19 issue of OUR HOMES Oakville Burlington Mississauga, p.46. Find local businesses in our Oakville directory. 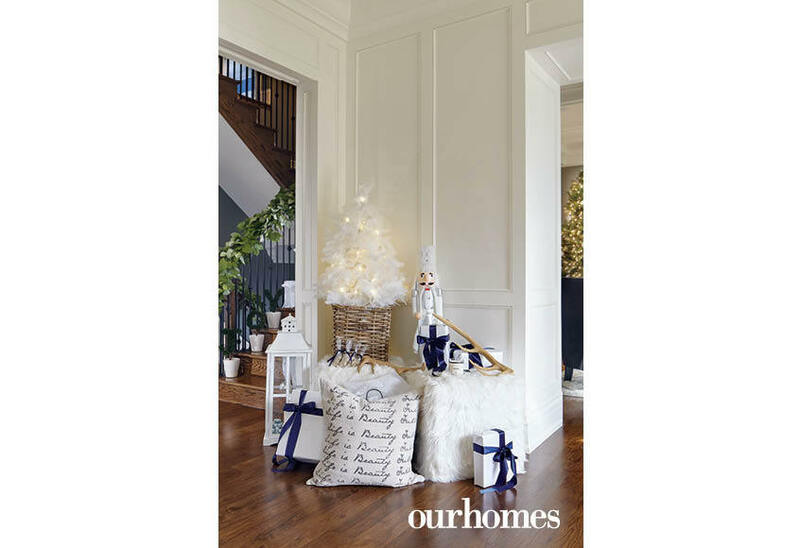 “As this was our first Christmas in our new home, we were so blessed to have found Diane Mackay from Rivercroft Interiors who understood what we wanted to achieve and created the perfect winter wonderland theme that flowed inside and out,” says homeowner Airikka Passmore. 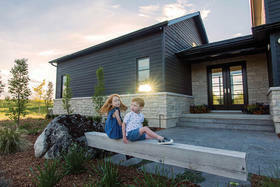 She and her husband Michael Nicholl were honoured to have their house showcased on the 2017 Milton Holiday House Tour, an annual event that raises money for the United Way of Milton. 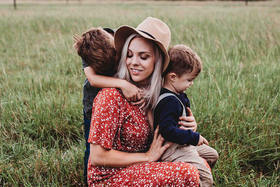 Their home is a modern take on a two-storey red-brick Georgian. Airikka and Michael wanted to incorporate rustic glam into their holiday decorating. "They have a young family and a dog, so whatever we did had to be liveable and not overly precious," says Diane. But it also needed to wow visitors on the tour. Diane and her team lined the front walkway with beautifully arranged birch and evergreen-scented candles. White lights cradled in garlands of pine and cedar lit the windows. Birch branches arched over the front entrance. 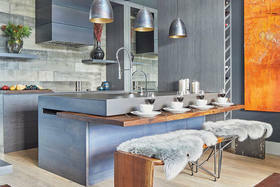 The theme carried indoors with a few main colours – white, black, silver and various shades of blue. The sitting room featured nail-studded black velvet chairs and a rustic black wood table. 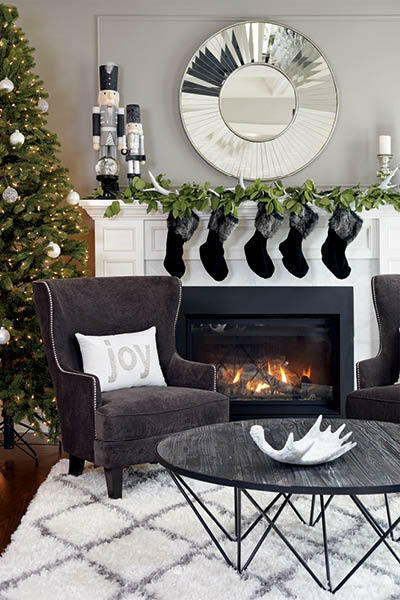 Black stockings trimmed with creamy faux fur were hung against the white fireplace mantel for dramatic contrast. Arrangements of salal leaves and eucalyptus added a festive feel and a fresh minty scent. A 10-foot white flocked tree was dressed from tip-to-toe in white and silver. 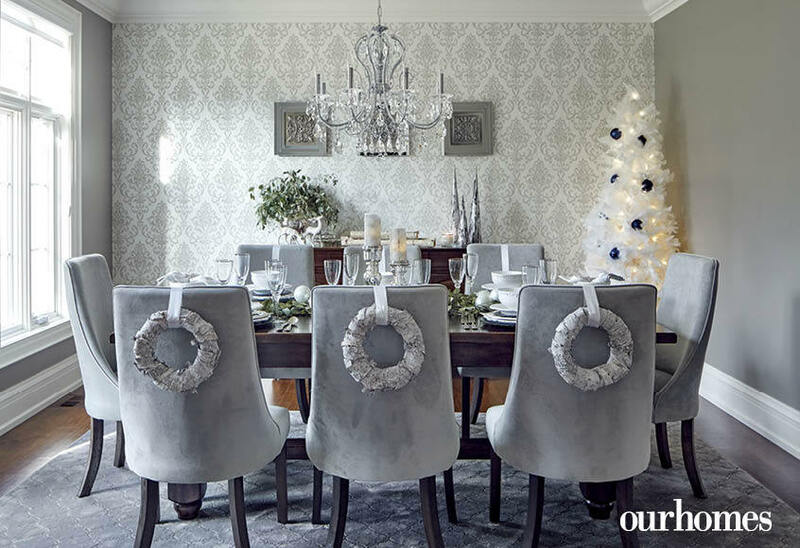 Decorative white antlers, faux-fur cubes, silver candelabras and pillows in hues of blue, grey and silver completed the effect. Pine cones and white boxwood-and-berry wreaths made a statement against the dark oak interior doors. The centre staircase was wrapped in salal, and each tread held a scented candle. In the living room, a flocked Christmas tree held a sparkling array of blue ornaments, including Disney ornaments (the family are fans!). Traditional nutcrackers sat next to glass jars and champagne glasses filled with gittering silver and blue balls. Birch branches arch over the front entrance of this modern red-brick Georgian-style home. The front walkway welcomes holiday visitors with beautifully arranged birch and evergreen-scented candles. Wreaths hang outside the five upstairs windows. 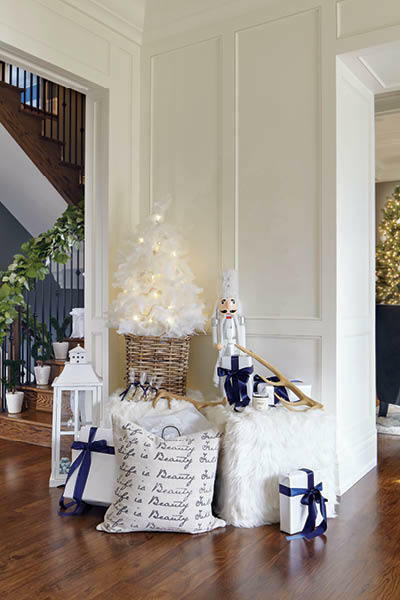 The entryway is made pretty with wrapped gifts and the glow of a pretty white tree. 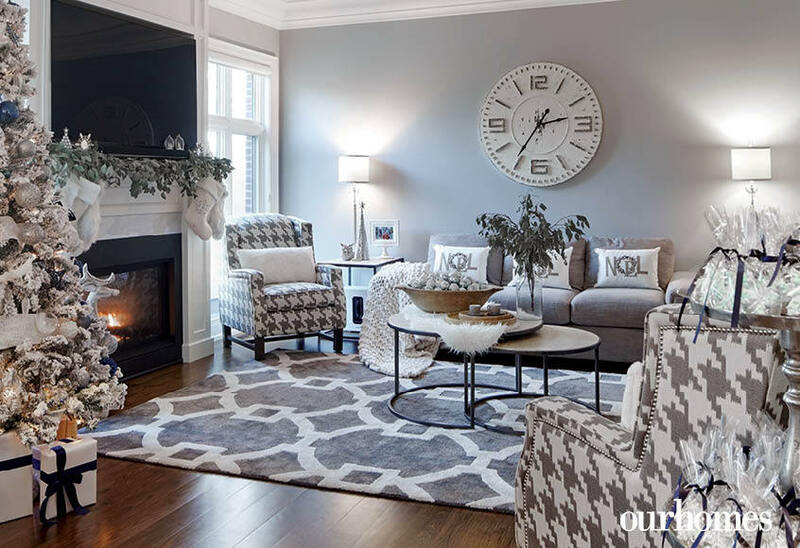 The living room blends fresh, earthy greens with dark, moody accents like black stockings. 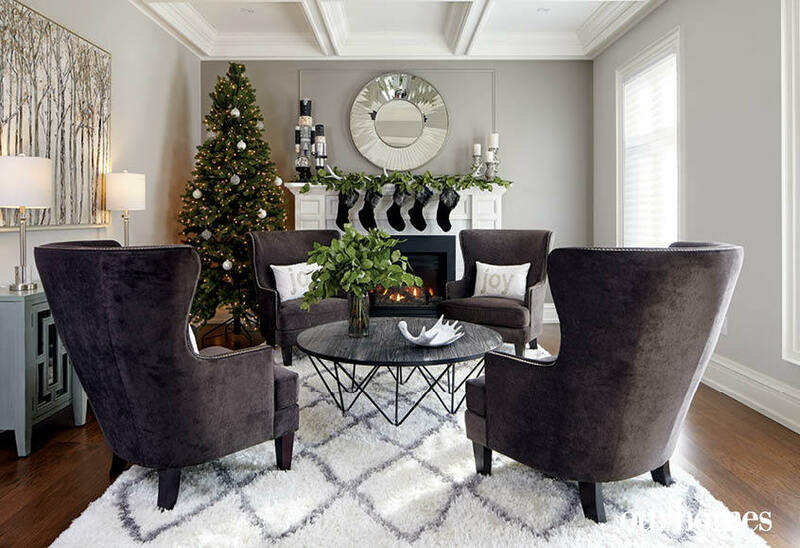 Nail-studded black velvet chairs and a rustic black wood table contrast with a white rug and fireplace mantel. The silvery dining room is aglow with warm light from the pretty white tree. Silk ribbon is added to each dining room chair. 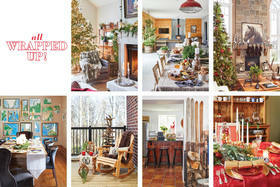 Greens bring the outdoors in to create a festive holiday table. 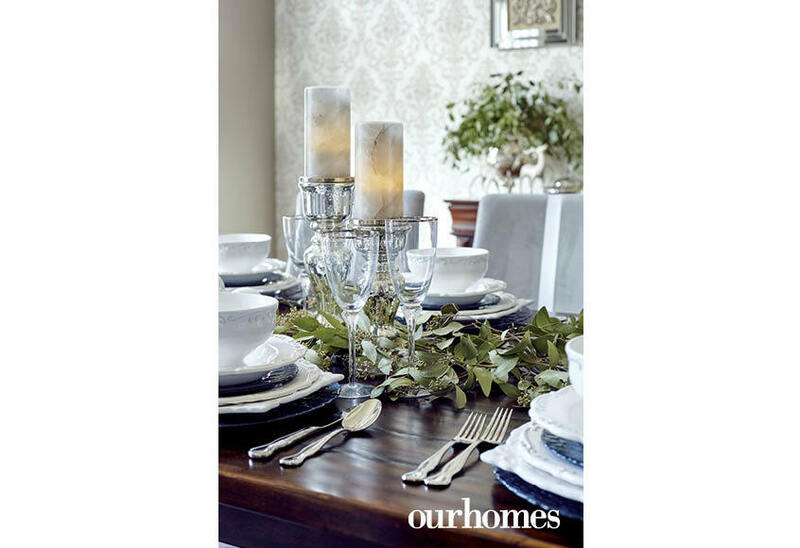 A grey velvet table runner showcases a centre arrangement of eucalyptus branches and birch accents. White, porcelain dishes contrast against dark placemats and chargers. 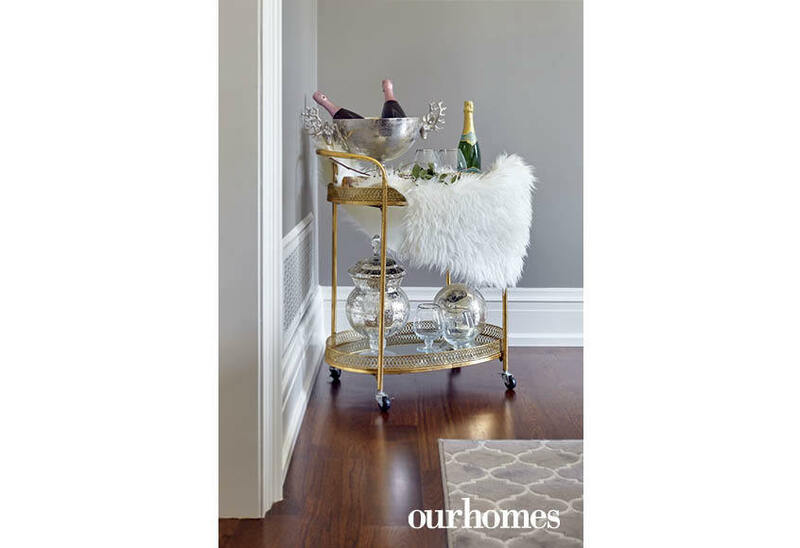 A bar cart in gold is a glamorous, functional addition to any holiday gathering. 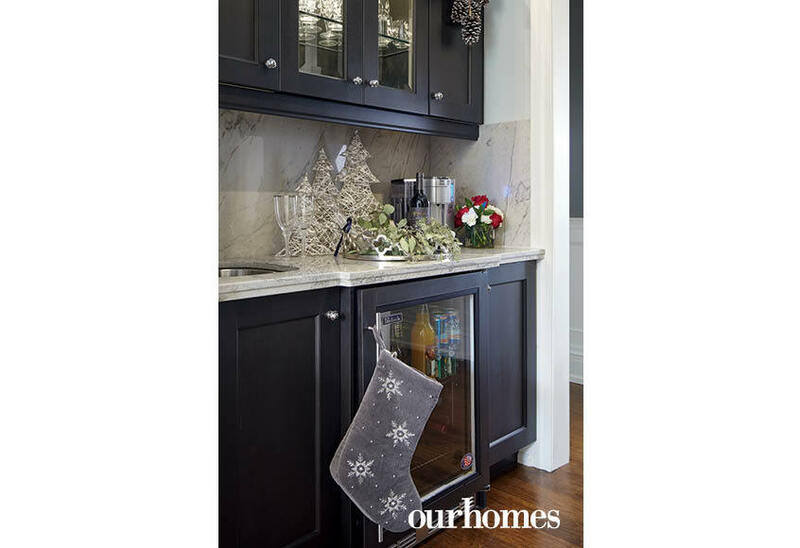 The servery is made festive with holiday accents. 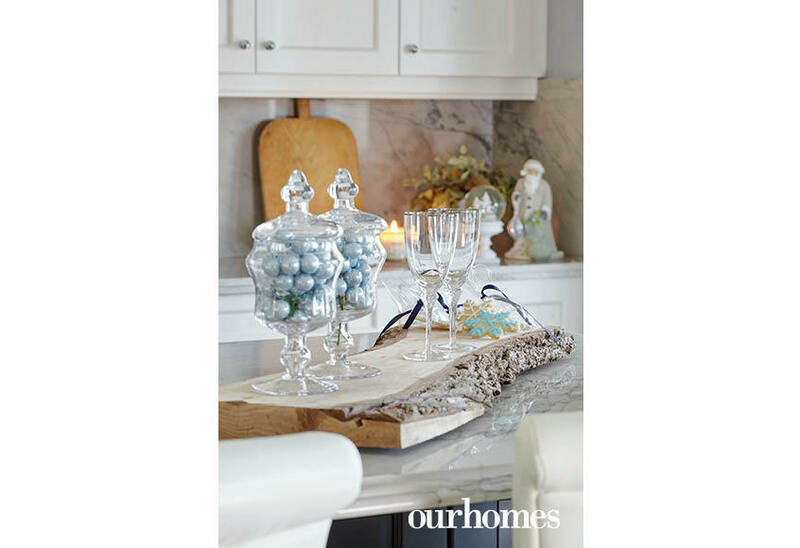 Simple additions, like pine cones and pretty white trees, help tie the kitchen into the rest of the decorated spaces. 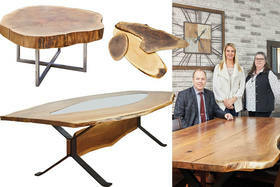 A live-edge serving board creates a rustic, wintery feel. 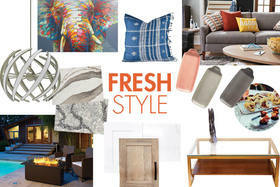 It’s cosy and warm with the addition of chunky blankets and faux fur accents in the living room. 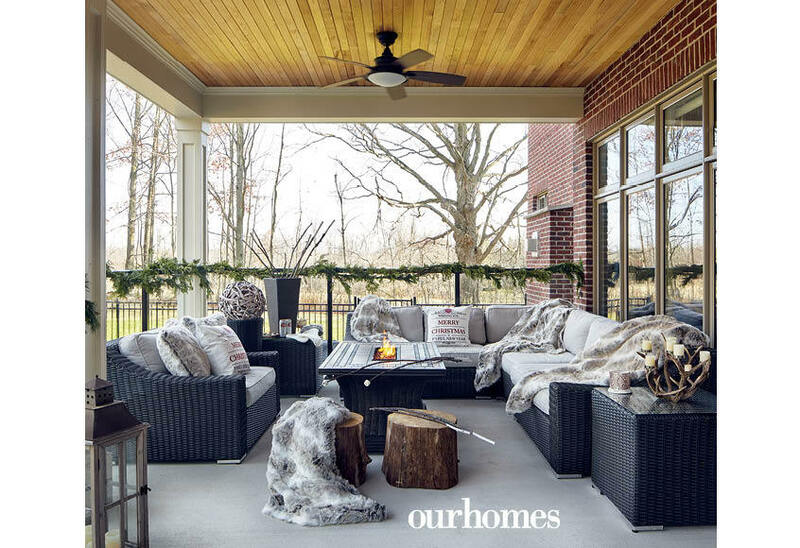 Wool and faux-fur blankets and cushions are tossed on easy chairs on the covered deck. A fire table offers a place to roast marshmallows. The handles on the roasting sticks are painted a festive white. 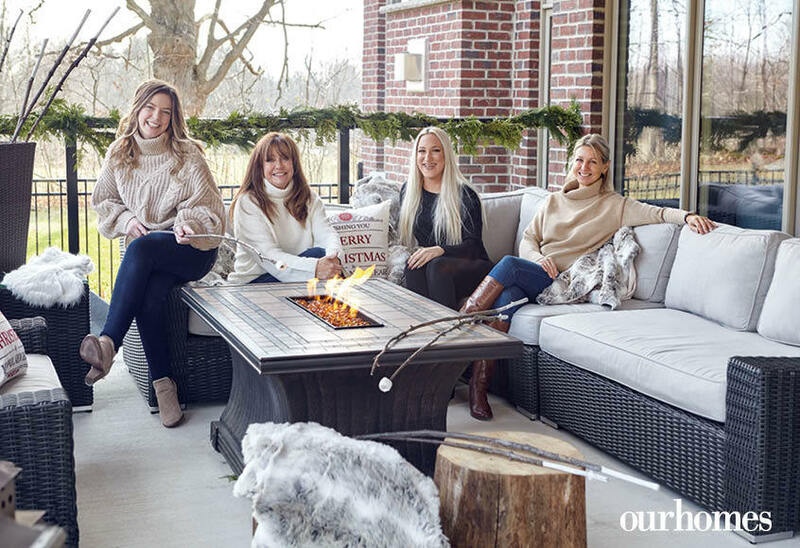 The Rivercroft Interiors team: Owners Brittany Nagy and Diane Mackay with holiday helpers Caitlyn Clancy Orti and Kristin Weber. 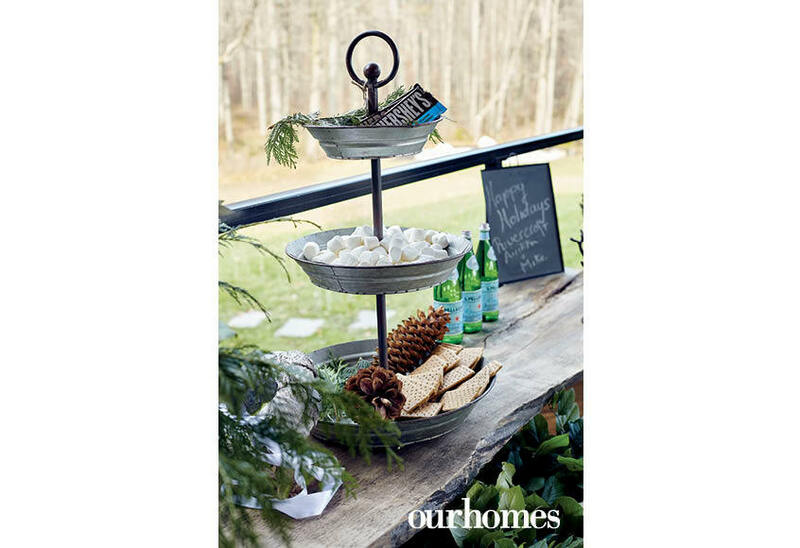 A s’mores station makes winter festivities merry and bright. Decorative accents can be brought outdoors to help set the scene.